The first months of this year have brought several important changes to TATRA, a traditional Czech company. Production and sales of heavy trucks of all model series have undergone significant consolidation and, in terms of statistics, these indicators have shifted to better numbers compared to the same last year period. Kopřivnice, April 8, 2013 - The TATRA brand has found a new owner, the Czech company TATRA TRUCKS a.s., which has ensured the continuity of production and taken over all the truck-maker’s activities. TATRA’s technical development and production regularly bring significant design solutions to the automotive market that offer comprehensive transport solutions to the customers in all industry segments operating the TATRA vehicles. TATRA, for the first time with the new owner, participates in a prestigious international building exhibition Bauma 2013. The thirtieth annual International Trade Fair for construction machinery, building material machines, mining machines, construction vehicles and construction equipment will be held at the Exhibition Center in Munich, Bavaria from the 15th to 21st of April 2013. TATRA has prepared, jointly with the German dealers Gerhard Friedrich und Metallbau Fahrzeugehandel and DAF Berlin Nutzfahrzeuge Vertriebs- und Service GmbH, a presentation of the current top of its production schedule in Hall B, stand No. 303. The most modern range of heavy trucks from Kopřivnice is represented by a four-axle TATRA PHOENIX tipper, which offers unique driving features and even greater added value for the customer in its standard 8x8 or 8x6 lightened version. The original chassis of the TATRA concept and powertrain components of foreign origin are, as well as a modern cab with a highly comfortable interior, a guarantee full satisfaction the most stringent customer requirements. Motorized with excellent, liquid cooled, PACCAR MX-13 assemblies, of course it meets the strictest emission limits according to Euro V Directive, and is also ready to meet the forthcoming progressive Euro VI standard, which will come into full effect from 2014. Renowned manufacturers such as MEILLER, one of the most important players on the market in this field, or dynamic Slovak producer, VS-mont, supply the tipper bodies. Both of them are strategic TATRA’s partners in the market segment of truck superstructures. Special TATRA heavy trucks are represented at Bauma 2013 by a mining construction truck TATRA 815-732R90/39 8x8.1 R (1+3) with a Fliegl building superstructure with the discharging system, ensuring effective emptying of the body cargo area without having to tilt. Customer requirements of a low overall vehicle height led to the use of a standard chassis of T 815-7 model range with a compact low cab and the aforementioned building superstructure emptying system. The original direct air-cooled eight-cylinder TATRA engine compliant with Euro V emission specifications with a maximum output of 325 Nm kW/2100 drives the vehicle. Automatic six-speed Allison 4500 transmission and a two-speed TATRA auxiliary transmission transmit the power output parameters to all four axle wheels, the vehicle is also equipped with an electric Telma retarder. A two-seat RHD cab TATRA 815-7 with integrated ROPS/FOPS (reinforced roof and cab structure with adequate mounts), which is necessary for safe operation in mining areas, is fitted on the four-axle chassis with the wheelbase 3,900 mm + 1,450 mm + 1,660 mm (arranged 1+3), axle load capacities of 9t, 2x16t and 9t with the steered first and last axles, air bellow suspension of the first and last axles and heavy-duty variant of the combine KING FRAME suspension system on the second and third axles with 16.00 R20 tires on the first and last axles and 24 R21 tires on the second and third axles. The last rear axle is steerable with the VSE electro-hydraulic system. The system works with curving the rear axle at the vehicle speed of 40 km/h. If necessary, the axle can automatically be centered to the zero position - the "safety" feature. It is a variant of the standard offer of special vehicles of T 815-7 6x6, 8x8 and 10x10 (8) model ranges with a low ROPS/FOPS cab intended for sale primarily on the Australian continent. However, TATRA company is able to offer this type of chassis to other markets too. The main production schedule of the TATRA brand builds on the latest model range of heavy trucks TATRA PHOENIX, where the unique design of Tatra chassis with the central tube and independently suspended and spring-loaded half-axles, drivetrain of foreign origin, highly valued modern cab design and advanced superstructure design are combined to a great advantage. For the Kopřivnice motor works, customers, business partners, colleagues or brand admirers and supporters, the TATRA PHOENIX model range means a significant step forward in meeting a concept of rigorous customer friendliness. Unique Tatra chassis design concept comprises several proprietary technical solutions. The chassis with the central tube is unique in the world, originating in Tatra 90 years ago exactly. Since then it has been tested under extreme conditions of all the world's continents. 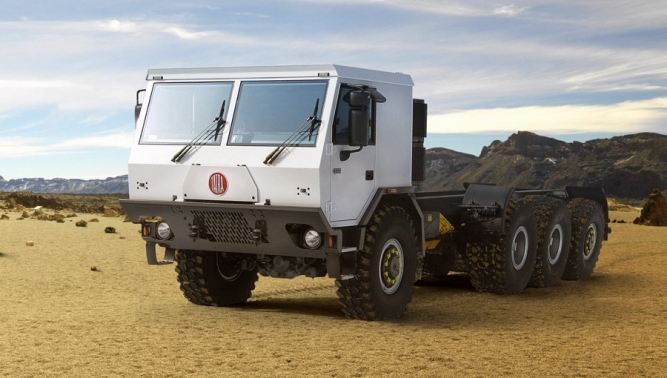 These vehicles successfully climb to almost all types of terrain on the planet. The central tube and the frame welded to it by means of cross members form an extremely rigid vehicle suspension system, which is significantly stiffer in torsion and bending compared to a common frame design. An important fact is that the extreme chassis rigidity is the result of combining the central tube and frame. Long-term measurements and calculations show that the central tube significantly contributes to the torsional rigidity of the chassis. High stiffness of the support structure decisively affects vehicle behavior and performance, as well as load to the frame and body. Flexural stiffness mainly affects the ride comfort (less demands on the driver’s cab mounting). High torsional resistance affects the stability and steerability (high lateral stability when cornering on road surfaces with a transverse slope and rugged terrain). Proven to reduce stress on the welded frame and superstructure (tankers, cranes, etc. ), which allows for easier mounting of superstructures. The Tatra concept chassis can work without a welded upper frame, which means that some of the superstructures can be attached by cross members directly to the central tube, which reduces material costs of the subframe for bodybuilders and allows for increased superstructure payload. A classical vehicle concept with a ladder frame can not afford similar solutions. The rigid chassis supporting structure, in conjunction with independently suspended swinging half-axles, allows for a greater, up to double off-road speed, in comparison to conventional vehicles, while maintaining comfort. The most advanced offer of the TATRA PHOENIX model range consists of a compact series of vehicles in 4x4, 6x6, 8x6 and 8x8 drive variants, supplemented with a 8x8 building machine with a total weight of 50 tons and a number of new design solutions, contributing to full customer satisfaction. Two-axle heavy trucks TATRA PHOENIX 4x4 offer five variants with a total weight of 20 tons. Two variants of S3 tippers with a wheelbase 3,700 mm, two variants of frame chassis with a wheelbase 4,090 mm and 4,500 mm and mounting options the so-called daily or sleeper cabs and, finally, frame chassis with a long four-door cab. Three-axle heavy trucks TATRA PHOENIX 6x6 feature 14 model variants in total. Eight variants with a total weight of 30t are divided into two groups in terms of rear axle suspension. In the group with the light-duty combined suspension of TATRA King Frame®, there are two models of S3 tippers with axle wheelbase 3,440 mm + 1,320 mm, three models of frame chassis with a wheelbase 3,440 mm + 1,320 mm, 3,900 mm + 1,320 mm and 4,500 mm + 1,320 mm, with mounting options of a daily or sleeper cab, and a tractor unit with a wheelbase of 3,440 mm + 1,320 mm with mounting options of a daily or sleeper cab. In the group with the rear axles suspended on leaf springs, there is a S1 tipper with a wheelbase 3,440 mm + 1,320 mm, primarily designed for very heavy-duty cycle operation, and a frameless chassis with a wheelbase of 3,900 mm + 1,320 mm with mounting options of a daily or sleeper cab. Three-axle vehicles with a total weight of 35 tons include five options: S1 tipper with a wheelbase 3,440 mm + 1,320 mm, S3 tipper with a wheelbase 3,440 mm + 1,320 mm, and three variants of frame chassis with a wheelbase 3,440 mm + 1,450 mm, 3,900 mm + 1,450 mm and 4,500 mm + 1,450 mm with mounting options of the daily or sleeper cabs. The offer of three-axle heavy vehicles TATRA PHOENIX 6x6 culminates with the variant of S1 tipper with a total weight of 41 t, hub reduction gears and wheelbase 3,440 mm + 1,450 mm. Four-axle heavy trucks TATRA PHOENIX 8x6 are the world’s new of the Kopřivnice motor works and they offer two basic variants in terms of a drive system on each axle wheel: 8x6 with the first front axle wheel drive (about 250 kg curb weight saving in favor of payload) and 8x6 with the second front axle wheel drive (about 300 kg curb weight saving in favor of payload). 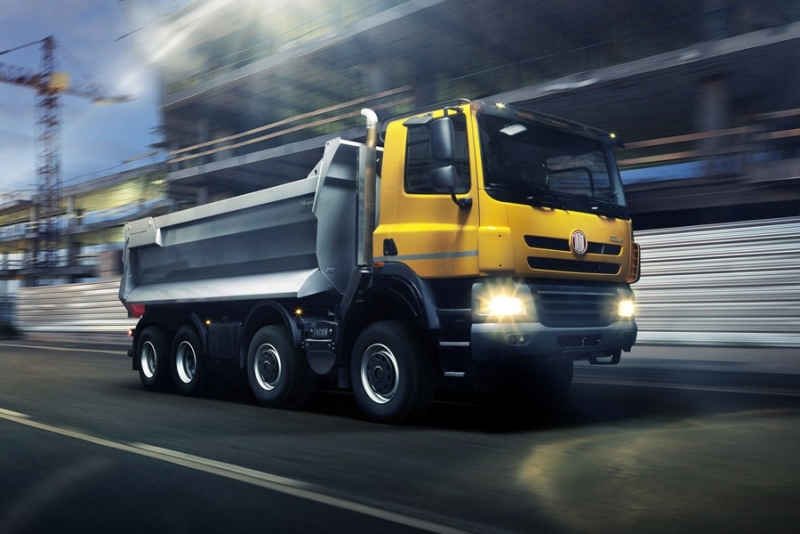 In combination with a light combined suspension TATRA King Frame®, the vehicle curb weight in the tipper version is approaching or is entirely comparable with the curb weight of competitor vehicles in 8x4 drive design. Major advantages of this drive design of four-axle TATRA PHOENIX vehicles include savings of diesel fuel consumption of up to 2 liters/100 km! Four-axle heavy trucks TATRA PHOENIX 8x8 include ten vehicle variants. Four models with a total weight of 41 t are represented by S1 tipper with a wheelbase 2,150 mm + 2,300 mm + 1,320 mm, S3 tipper with a wheelbase 2,150 mm + 2,300 mm + 1,320 mm, and two variants of frame chassis with a wheelbase 2,150 mm 2,300 mm + 1,320 mm and 2,150 mm + 2,900 mm + 1,320 mm with mounting options of the daily or sleeper cabs. Four models with a total weight of 44 t are represented by S1 tipper with a wheelbase 2,150 mm + 2,300 mm + 1,320 mm, S3 tipper with a wheelbase 2,150 mm + 2,300 mm + 1,320 mm, and two variants of frame chassis with a wheelbase 2,150 mm 2,300 mm + 1,320 mm and 2,150 mm + 2,900 mm + 1,320 mm with mounting options of the daily or sleeper cabs. The last two variants of four-axle TATRA PHOENIX 8x8 vehicles include vehicles with a total weight of 50 tons. Both of them have S1 tipping superstructure and a wheelbase of 2,150 mm + 2,560 mm + 1,450 mm. In the Czech Republic, these vehicle variants are homologated in the category of "working machines". All TATRA PHOENIX vehicles are equipped with a liquid-cooled, inline six-cylinder PACCAR MX-13 with a displacement of 12.9 liters (130 x 162 mm) in the following power versions: 265 kW/1775 Nm, 300 kW/2000 Nm, 340 kW/2300 Nm and 375 kW/2500 Nm. The first three types of motorization are available in emission specifications Euro V, Euro IV or Euro III, the most powerful motorization only in Euro V emission specification. PACCAR MX-13 engine with a maximum output of 375 kW/2500 Nm is exclusively designed for 6x6 and 8x8 vehicles with hub reduction gears, intended primarily for the mining industry. To achieve the emission limits according to respective Euro V standards, a proven and highly reliable system is used for purifying exhaust gas downstream the manifold using SCR technology (Selective Catalytic Reduction), working with the technical fluid AdBlue. All TATRA PHOENIX vehicles are fitted with ZF transmissions in two variants: Ecosplit, 16-speed manual transmission with the option of integrated retarder installation (intarder) and ZF AS-Tronic 16-speed automated transmission with electric clutch control and also with an optional integrated retarder (intarder). ZF AS-Tronic automated transmission is available upon request for all types of TATRA PHOENIX heavy trucks since April this year. It is equipped with optional "Off-Road" driving mode, software developed exclusively by Tatra designers based on long-term tests in cooperation with ZF technology. With the automated gearbox ZF AS-Tronic, it is possible to fully use the automatic gear shifting mode or choose the manual mode, which can bring certain advantages, especially when driving in difficult terrain. The automated transmission is complemented with a very practical "Hill holder" feature, ensuring smooth drive-away in a hilly terrain. TATRA axles with independently suspended swinging half-axles with axle differential locks are of two versions. They feature the gear ratio 3.385 (without hub reduction gears) or 2.714/2.33 (without hub reduction gears). The front axle is suspended on air bellows combined with telescopic shock absorbers and torsion stabilizer. Load capacity of 8 tons or 9 tons are available upon request. The rear axles, if suspended with leaf springs, have the load-carrying capacity 11.5 t. The design with light-duty variant of KING FRAME combined suspension (air bellows with an internal coil spring) has the load-carrying capacity of 11.5 t and heavy-duty variant of KING FRAME combined suspension (air bellows and leaf springs) offers the capacity of 13 or 16 tons.